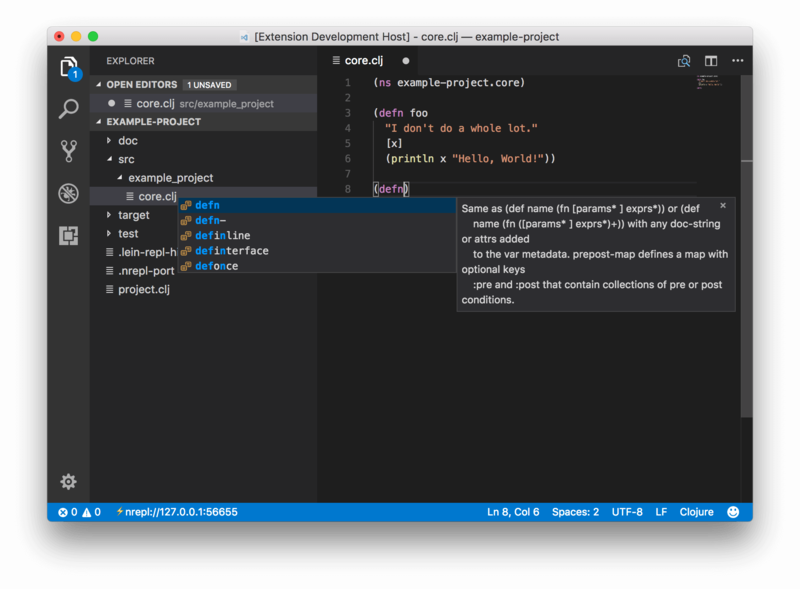 Visual Studio Code>Programming Languages>ClojureNew to Visual Studio Code? Get it now. 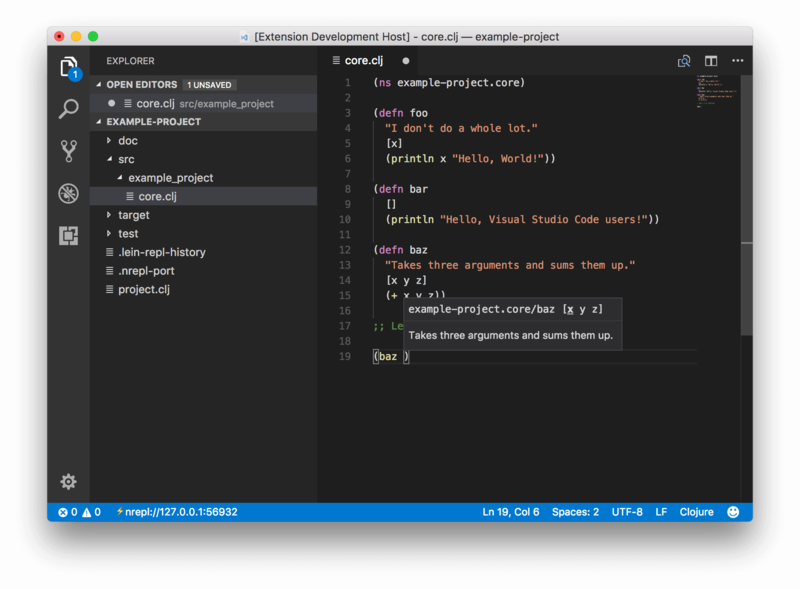 Clojure and ClojureScript support for Visual Studio Code. If you are a ClojureScript user, please read this section carefully. Doesn't work? Not exactly what you need? See the Manual Configuration section! with lein, do lein repl :connect. 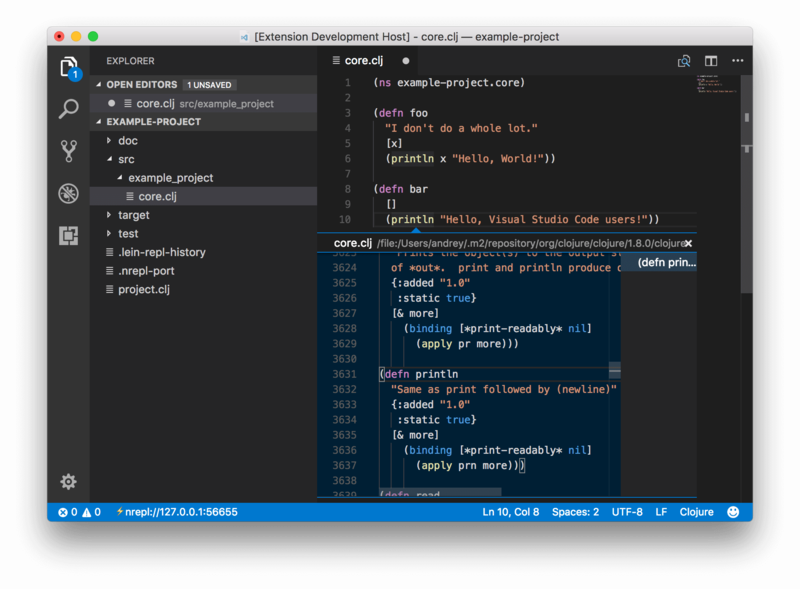 Clojure: Eval (in the command palette) will compile the current file in the editor and load it in the REPL. Alternatively, you can put the code above to your project project.clj file. The extension contributes the configuration parameters listed in the table below. clojureVSCode.autoStartNRepl Whether to start an nREPL when opening a file or project. clojureVSCode.formatOnSave Format files with cljfmt on save. The extension has the experimental support of ClojureScript. The example of a ClojureScript project setup can be found here. Checkout the project profile.clj file to learn what dependencies you need. After that you can connect to the nREPL using the "Clojure: Connect to a running nREPL" command. Now you can evaluate you ClojureScript code and use the other extension facilities. Open an issue if you want to propose new features and ideas or to report bugs. If you want to help with some code and looking for a place to start, please check out the How to Contribute wiki page.